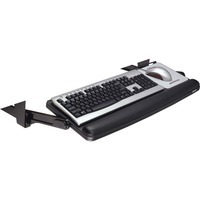 Underdesk keyboard tray provides height and tilt adjustment below desk for standard workstations. Wide platform places mouse next to keyboard for added comfort. Mouse cord guard keeps mouse from falling off. Mousing surface can be used to the left or right of the keyboard. Keyboard drawer will work in standard workstations. Drawer includes a 17 track, full width gel wrist rest and Precise Optical Mousing Surface. Wrist rest has antimicrobial protection.